Look around you and you’ll likely observe that everyone else exhibits the same feeling. As a society, we’ve become accustomed to the idea that all our heart’s desires should be given to us in an instant. Companies only serve to perpetuate this habit by churning out product after product with the sole goal of making our lives easier and everyday tasks faster. Between apps that allow you to make purchases and delivery requests at the touch of a button, to a constant stream of advertisements, all with the same message “if you don’t own it, you need it now,” society has been molded into an army of consumers all looking for one thing: instant gratification. Unfortunately, our consistent practice of instant gratification might be affecting our financial lives more than we realize. Ergo the millions of people with credit card debt. Those that don’t possess debt are those who have mastered delayed gratification. They are people who hold off 24 hours before making a purchase, or even better, forgo various items in favor of a greater purchase in the future. Delayed gratification not only provides you with the ability to save money and buy only the things you really want, but serves to assist you in achieving your financial goals as well. 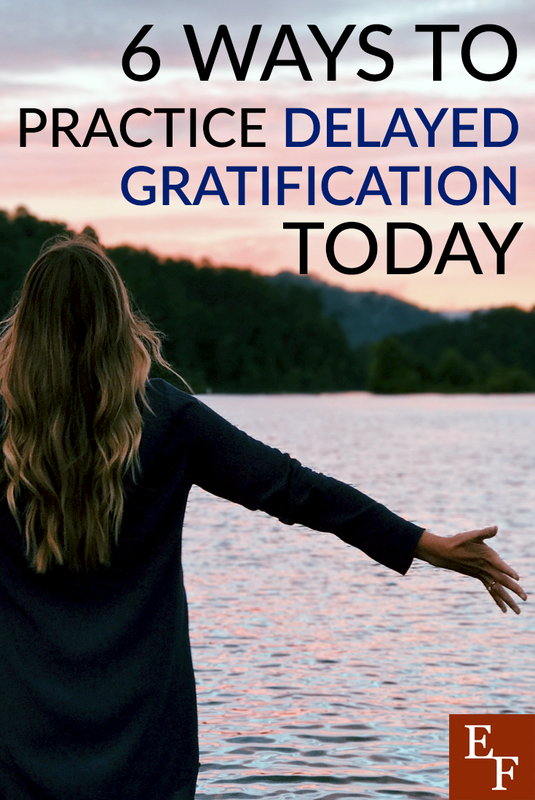 To successfully practice the habit of delayed gratification, incorporate these six steps into your life. Different people hold different values. What’s significantly important to you might not be to another person, and it’s imperative to remind yourself of that. Just because your neighbor values a new car every year, doesn’t mean you need one too. Your values are what guide many of the big and small decisions in your life. What you choose to spend your money on should be no different. Before making any purchase, ask yourself if it’s one that falls in line with what you deem important. Don’t let what someone else or even all of society tells you you should buy, dictate how you allocate your money. Remind yourself of your values and you might find that delayed gratification isn’t as difficult as it seems. When it comes to your finances, spending spontaneously and working sans a plan, only serves to lead you towards financial trouble. However, when you write out a specific plan or budget for your monthly income, you have a clear view of how your funds are allocated. By gaining a bigger picture of your expenses, you’ll be more aware of where your income really needs to go and likely become more hesitant before making a purchase that could potentially affect those expenses. The problem with practicing delayed gratification is the myriad of temptations that we’re constantly surrounded by. Stores and websites everywhere are designed to allude to the part of your brain that wants to make impulse purchases. In fact, impulse buying is usually the moments in which we practice instant gratification. You’re standing in line or walk by an aisle, see something you want, and instantly add it to your cart. In reality, it’s really not your fault. Stores pride themselves in their ability to persuade you to purchase more. Thankfully, there are ways to combat this. Simply make a list. Know what you want and need before going into the store and don’t allow yourself to sway from that list. That way, even if you do see something more you want, you can simply add it to the list for next time, chances are, you might decide that you don’t really need that item and remove it from the list altogether. In life and consumerism, there are certain items that you’re going to want more than others. Unless you have all the funds in the world, you’re going to have to decide what means more to you. Before moving forward with any purchases, take 24 hours to actually think about it or opt to create a list of items you want, but don’t really need. In the end, you might find that you don’t want that item any more or that you’ve found other more important things you need instead. And in terms of the list, give yourself at least a week or two, as you might find drastically different priorities at the summation of that time period. That fast car or designer blouse might seem like the most important thing now, but it’s imperative that you look at the bigger picture in life before putting all your income towards the now. Carefully consider your bigger financial goals in life. Maybe you want to own a home someday, put your kids through college, or have the ability to retire early. Frivolously spending your money on wants you have in the moment, could put you that much farther from your overall dreams. Create reminders, like a board of your dream house, a list of potential colleges, or a collage of all the plans you have for retirement. Then, every time you have a new want take a look at the larger things you hope to accomplish. You might be surprised how much your more important goals can deter you. Going through life and constantly putting away every penny you make is not only a bit of a buzzkill, but can make practicing delayed gratification that much harder. Don’t forget to reward yourself with something small every now and then. To prevent major splurges, create smaller goals and achievements for yourself and put reasonable rewards at the end of them. You’ll keep yourself motivated and on track without completely depriving yourself of some of life’s joys. Delayed gratification is the definition of counterintuitive in our society. And at times, it can be hard to drown out the noise around you in order to follow your own path. Nonetheless, if you can remind yourself of the important things in life and keep your temptations at bay, not only will delayed gratification be easier, but your finances will be happier as well. And in the end, achieving your major financial dreams will feel eons better than making that small, instantaneous purchase. If you practice delayed gratification, what are some of the tools that help you avoid splurges?